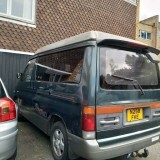 12/04/19: Reluctantly looking to sell much-loved 1995 Mazda Bongo Friendee (diesel, automatic) due to recent MOT failure (details available). Mechanically sound but needs welding and TLC. Includes sink, cooker, made-to-measure mattresses & bike rack. 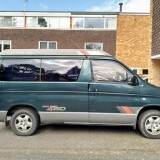 Mobile 07581363232 Email tizerdog@hotmail.com Tunbridge Wells. No canvassers.